great light above the sink too. i'm new to your blog - i am really enjoying it. Love! That mirror in the kitchen is my favorite part! i was just drooling over this kitchen a few days ago. it's one of my absolute favorites. i think that mirror is a stroke of brilliance. Wow - this is gorgeous. oh my gosh, i LOVE it. the flowers and the mirror and the island...it's perfect. I'm sooo stealing this post for my blog. sorry (but I did at least warn you first). (and hilarious, Kyle and Hillary. I've been saying all day). I love the mirror. Wish I had a spot in my kitchen for a mirror. Hmmm.....I may have to figure that out. I love it! How are you girlfriend? this is quite lovely. i love that warn leather chair peeking out in the corner. 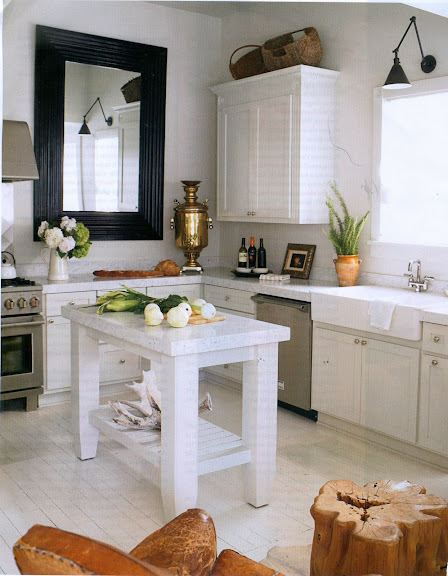 A Black & White tiled floor would be perfect for my taste. . .I love the clean sleak look. Ooh! I like it too! The warm wood tones with the clean lines....yum! that is exactly my dream kitchen. exactly.